Home › Budgeting Tools › What Is The Best Financial Calculator? What Is The Best Financial Calculator? 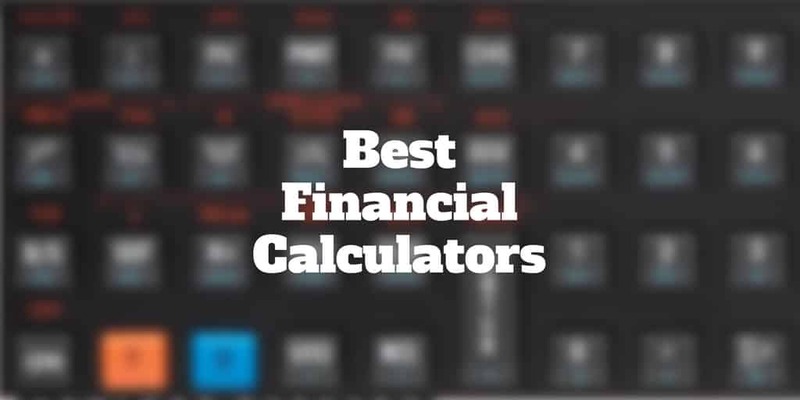 Whether you work in economics, finance, accounting, or statistics, or even if you are a business student or MBA looking for the best financial calculator, this guide will help you to compare the leading brands and pick the best one. Financial calculators are so smart these days that even the cheaper selections usually suffice for most general purpose use. However, if you are a statistics whiz or an actuary looking to perform complex mathematics, some of the higher cost calculators will have more built-in functions needed. Beyond choosing a calculator based on its functionality and price, add other considerations into your decision-making, such as its ease of use and versatility. Above all, make sure it does what you need it to do. If you work in the investing space, discounted cash flow calculations may be a priority. If you are looking for a financial calculator for MBA classes then NPV, DCF, and interest rate calculations may be most important. As a real estate investor, you may need to focus on depreciation and amortization calculations. The bottom line is you should pick the calculator that solves the problems you will face while factoring in cost and ease-of-use too. 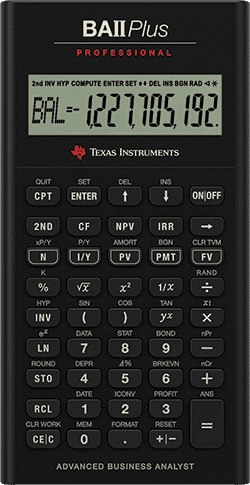 The Texas Instruments TI BA II Plus Professional Financial Calculator is designed to save you time when performing complex equations. If you are an undergraduate or MBA business student or you work in investments, accounting, finance, or as an actuary, the TI BA II Plus has all the functionality you will probably ever need. For students who need math functions, the TI calculator performs trigonometric calculations, natural logarithms, and powers. It is a good fit for investors who need to perform cash flow analysis. And it can perform as many as 32 uneven cash flows with up to four-digit frequencies. Professionals working in finance, accounting, and economics can use it to calculate the time-value of money, depreciation, accrued interest, and cost-sell margins. Other features of the calculator include functions like Modified Internal Rate of Return (MIRR), Net Future Value (NFV), Discount Payback, and Modified Duration. The only drawbacks of the calculator are stiff keys, though arguably it is constructed this way in order to avoid inadvertently pressing on keys and making mistakes. Some users may find it less intuitive than HP models to arrive at answers. 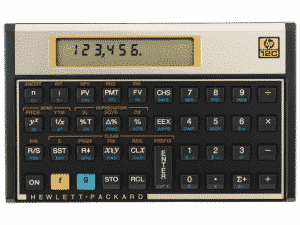 The HP-17-B-II+ may well be the best virtual calculator pocket PC. It is designed for business and finance professionals, and will serve the needs of real-estate professionals well too. The 17bII+ can help finance professionals to calculate bond price and yield calculations, currency conversions, and perform cash-flow analysis and interest rate conversions. Real estate professionals may find the depreciation and percentage calculations especially useful. And accounting and economics professionals along with students will find the HP 17bII+ calculator flexible enough to meet their needs too, including TVM and amortization features as well as algebraic data-entry modes and 250 easy-to-use functions. If you don’t need all the bells and whistles of the HP-17-B-II+ calculator, the HP 10B is a solid alternative. Where the HP-17-B-II+ features 250 built-in functions, the HP 10B includes approximately 100 built-in functions. 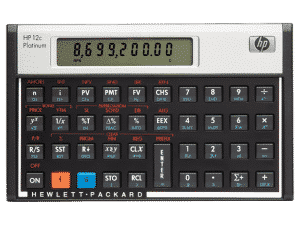 The HP 10B calculator can be used for mathematics, business, finance, and statistics. It is ideal for business students attending fast-paced courses who need to calculate loan payments, discounted cash flow analysis, time value of money for loans, leasing and savings, amortization, and interest rates. The keyboard is laid out intuitively and the labels are easy to read plus the HP 10B calculator features an algebraic entry system and an LCD screen with up to 12 characters on one line of text. It’s a compact calculator so it can fit easily into your briefcase, school bag, or backpack. Plus it comes with a 1-year warranty. HP 10B Financial Calculator Battery: 3 x LR44 batteries required. 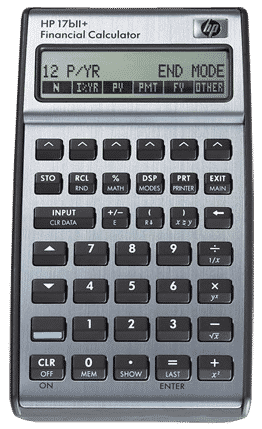 The HP 12c Platinum Financial Calculator lies somewhere between the HP 10B and HP-17-B-II+ calculators in terms of functionality and price. With over 130 functions, it has fewer functions than the HP-17-B-II+, which has around 250+ functions, but it has more than the 100 functions built into the HP 10B. If you are looking for a great mix of statistical, business, and math functions, the HP 12c delivers. It’s a cinch to calculate interest rates, loan payments, and conversions. Plus, it has an intuitive layout that makes it easy to operate. Whether you are in economics, finance, accounting, or real estate, the HP 12c Platinum Financial Calculator should suffice. The HP 12CP Platinum Financial Calculator is known for its high quality, durable design and long battery life. 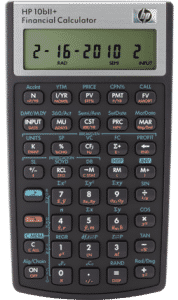 But beyond its robustness and versatility, the HP 12CP is a great solution for use in business, mathematics, finance, and statistics with over 120 built-in functions. It is compact and can be transported anywhere easily. 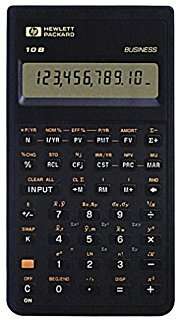 In fact, this might well be the ultimate pocket calculator having proven itself popular for over a quarter of a century. The HP 12c Platinum is the enhanced version of the industry-leading HP 12c calculator, and it features time-saving functionality like keystroke programming with 4x more memory for up to 400 steps. Both RPN and algebraic modes of data entry are supported as well as “undo” and “backspace” buttons. Plus, the HP 12c Platinum has memory for up to 80 cash flows, which makes it ideal for finance, accounting, business, economics, and real estate. It is also permitted for use in CFA and CFP Certification Exams, as well as GARP FRM Exam. A nice bonus is that if you run into any issues, you can access HP support around the clock every day of the week thanks to downloads, tutorials, and educational resources. Like the HP 12c Platinum calculator, the HP-10-B-II+ is permitted for use during the CFP Certification Exam. Whether you need it for business or finance, it is a smart choice because of its extensive functionality. Beyond use in business studies and finance, the HP 10bII Plus can be used in accounting, general math, real estate, science, statistics, pre-algebra/algebra, and banking. One of the reasons it can be used in so many fields is its laundry list of built-in functions, which number over 170. The HP 10bII features an LCD display and a battery life projection of approximately one year. To save on battery use, an auto power-off button will turn the device off after 5 minutes. >> What Is A Firm’s Market To Book Ratio? >> What Does YoY Mean?